If history truly does repeat itself, then perhaps we can take a chapter from World War II and fruitfully apply it to the 21st century. At the outset of hostilities, even before 1941, it became clear that the military had a significant supply problem with a particular material needed for mobility and other uses such as wire insulation: rubber. Harvesting latex from a rubber tree. Source: Wikimedia Commons. With the development of the automobile, demand for rubber soared and a vicious Brazilian industry rapidly grew. But by the late 19th century, rubber seeds had been successfully exported to Southeast Asia and, from then on, the Brazilian sourcing of rubber declined dramatically from basically 100% to, by 1940, merely1.3%. Which brings us to the start of WWII. The US was dependent on Asia for its rubber supply, and wars on two oceans cut off 90% of the supply. Franklin D. Roosevelt established the Rubber Reserve Company, forcing the major rubber companies to work together and all but conscripted the scientists and engineers in the field to develop reliable synthetic sources of rubber. That source: petroleum. Germany had, out of necessity, actually produced synthetic rubber in WW1, but it was much more expensive than natural rubber and, therefore, manufacturing ceased when that war ended. Now, there was an immediate dire need for the US to advance that research and put it into cost-effective production. The wartime effort prevailed (along with such conservation measures as lowered speed limits to decrease wear on tires) and by the end of the war the US was producing almost as much rubber as it had been importing. Manufacture of natural rubber versus synthetic rubber. Source: Mindfully.org. 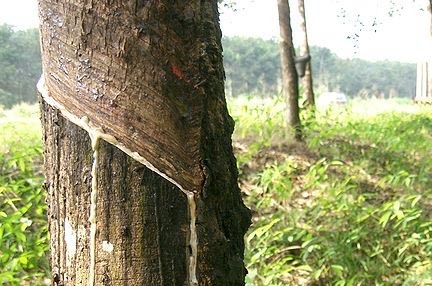 It’s not a perfect environmental parable since natural rubber was displaced by synthetic rubber, dependent on petroleum supplies that eventually had to be imported. The synthetic rubber manufacturing process, too, is not exactly a clean industry. (Not that natural rubber harvesting, as conventionally practiced, was all that sustainable either.) The point, though, is that the US recognized a severe problem of national security and determined that the response had to be stimulation of domestic industry. An all-out effort was initiated and, five years later, amidst wartime conditions, the problem was essentially solved. Ironically, seventy years later, it’s the petroleum whose supply is threatened. This time, though, it’s not only rubber production that is in jeopardy; it’s our entire industrial base as well as our lifestyles, that “American Way of Life.” And what’s our national response? Let’s frantically grab onto a diminishing supply of increasingly expensive and increasingly dirty fossil fuel sources and perhaps postpone the problem by a few years while doing nothing to address the core problem. And in going that route, those core problems become even harder and more painful to remedy – if indeed remedies are then still possible — later. If we had the leadership we had in the 1940’s, it would be a different picture. Yes, speed limits would be reduced to conserve fuel (as they were, but only temporarily, in the seventies). But moreover, we’d see a national effort – one akin to a wartime effort, not our current haphazard and intermittent programs – to ensure our national security by simultaneously decreasing demand for fossil fuels and developing alternative sources. The synthetic rubber initiative in the 1940s was a matter of life or death. Without alternative rubber production, the war may well have turned out differently. Is the need now for renewable energy significantly different? As then, we face endangered supply lines. On top of that, the supply currently endangered is itself finite and disappearing rapidly (we’ve used up 500 million years of accumulated fossil fuel in less than two centuries) and its usage is creating issues both local and global, and threatening our health, our food supplies and perhaps our survival. 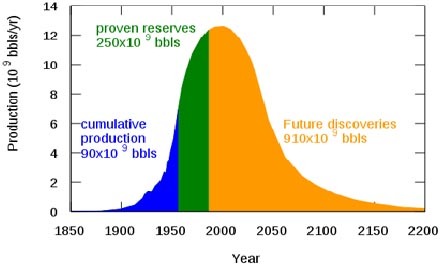 Hubbert’s Curve (above, source: Wikipedia Commons) is a common depiction of imminent peak oil. But perhaps more illuminating and dramatic is this graph (below) from one of my favorite geek blogs, Do the Math. Over millions of years, the Earth slowly accumulated a stockpile of fossil fuels. We suddenly started extracting them only a century or two ago, and are using them up far faster than the planet can replace them. “Blowing through our inheritance” is what Do the Math author, Tom Murphy, calls it. The enemy is different. It’s not as easily identifiable or as obviously evil as countries attacking us (leaving aside Middle East politics and terrorism), but it is at least as menacing. Our way of life is endangered not, as George W. Bush said, by action to fix a combined strategic, economic and ecological problem, but by inaction. Perhaps the big difference is that, at the end of this “war” effort, the outcome is not merely survival, but our flourishing: better, healthier and happier lives on a cleaner, healthier planet. Not acting puts everything at risk. In acting, on the other hand, there is very little to lose, and everything to gain. It’s the consummate win-win-win scenario and shying away from it is not merely foolhardy and shortsighted, but in fact unpatriotic. So our role models are petroleum-based rubber and the atomic bomb? Many say we need a contemporary Manhattan Project to develop renewable energy. Perhaps the concurrent rubber project, with its industry focus and strategic parallels, is a better model. A big, and positive, difference is that, while there was really only one possible substitute for imported rubber, there are quite a few potential substitutes for petroleum. We use oil both as an energy source and as a basis for synthetic materials (like, ahem, rubber). However, we can generate energy from a number of renewable sources, and there are alternatives – existing or in development — to making plastics and other materials from petroleum. 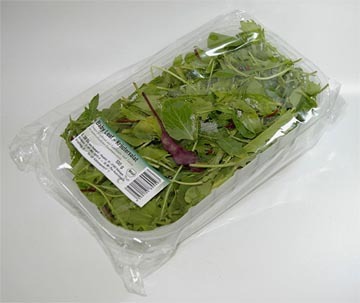 Produce packaged, appropriately enough, in bioplastic. Source: Wikimedia Commons. The question might be: how do we create the political environment, as WWII did for rubber, for renewable energy? Preferably, without a war. The strategic importance argument is there, but it hasn’t taken hold in the imperative way that synthetic rubber did. And if I am to be consistent in favoring the carrot over the stick, the demand should not arise from fear – though it’s a helluva motivator – but from desire. What’s needed to engage the next Manhattan or Rubber Project? This entry was posted in Economics, Energy, Policy and tagged fossil fuels, renewable energy, win-win-win on July 26, 2012 by David Bergman.